Wizkid has been in the news of late, and it’s all related to the upkeep of his children. 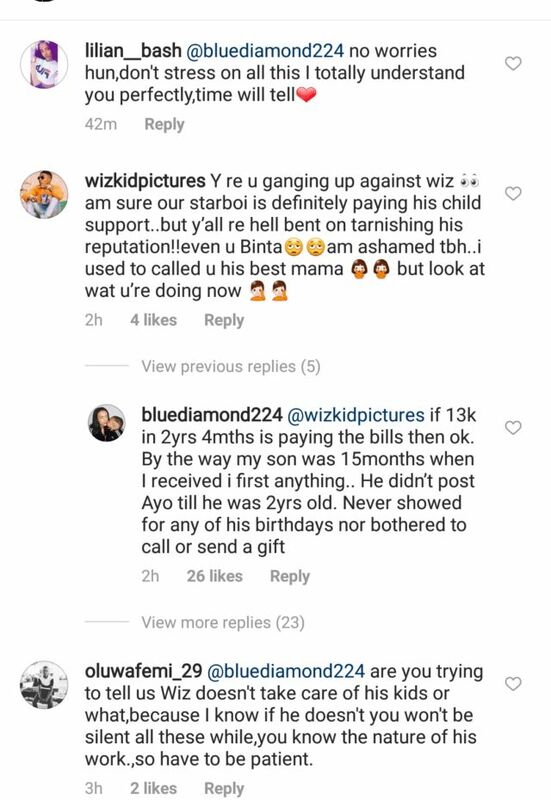 Few days after he was indirectly called out by his first baby mama, Shola Ogudu, Binta Diallo, Wizkid second baby mama has come for him with claims that Wizkid has only spent $13,000 on their child in two years. In Binta’s case, She explains that she was left to take care of their son alone for 15 months before Wizkid stepped in, and even when he did, he only supported her with $13,000 over a period of 2 years. She has called on him to “Take care of your home first before impressing the streets”. I Workkkkk Sooooo Hardddddd Ma G!!!!! Sooooooo Harddddddd!!!!! Damnnn!!! Being a Mom and a Dad and Still Manage to Slay all at once on a Legit Income!!! Please I need my accolades served chilled!!!! boy for a while until she delivered her baby which was kept on a low. Wizkid has had an history of neglecting his kids and baby mamas, recall that back in August 2011, Wizkid denied claims of fathering a child with Shola and in 2013, he came out publicly to acknowledge the child. After Shola and Binta’s claim, Could this be true and is $13,000 not enough for two years?? ?